The physicians and staff at Mississippi Vision are dedicated to using the latest technology available to provide customized solutions for each patient’s specific needs. “Custom LASIK” or “Wavefront-Driven LASIK” is an advancement in laser vision technology that provides the surgeon with previously unattainable diagnostic information to customize LASIK procedures to each patient’s individual needs and to potentially improve the already excellent results obtained with traditional laser vision correction. This technology is now used to record detailed information about the visual characteristics of the eye. Unlike standard measuring devices such as corneal topography, which measure only the front surface of the eye, called the cornea, the wavefront scans the way the entire optical system processes light. Once the wavefront data has been documented for an individual patient, this information is used to guide the excimer laser to correct the higher-order visual aberrations. 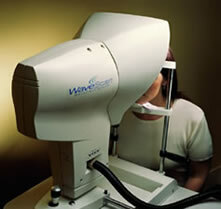 The surgeon can then determine what adjustments must be made to the corneal surface to produce a clear, crisp image for the unique individual needs of each patient. Early data suggests that 5-10 percent of patients who demonstrate higher-order aberrations are the patients that will significantly benefit from Custom LASIK treatments. Other patients may benefit from Custom LASIK to a smaller degree. 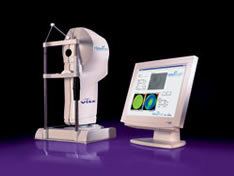 The VISX® laser utilizes The VISX® WavePrint™ System including the WavePrint Map, 3D ActiveTrak™ Eyetracker and Variable Spot Scanning (VSS™). The WavePrint™ Map (Figure 1.) 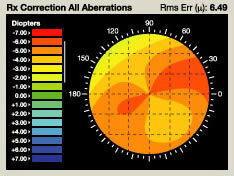 is the diagnostic tool that documents the precise analysis of the unique visual system. The 3D ActiveTrak™ follows the tiny motions of the eye instantaneously and automatically in all three dimensions, repositioning the laser as the eye moves slightly to ensure accuracy. 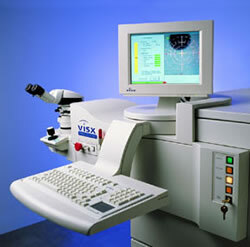 The VSS™ is an exclusive VISX® laser technology that allows for a larger treatment area than previously available. This offers the physician greater flexibility in developing a more personalized laser vision procedure, when pupil size may be a consideration. Statements regarding the potential benefits of wavefront-guided LASIK (CustomVue) are based upon the results of a clinical trial. These results are indicative of not only the CustomVue treatment but also the care of the clinical physicians, the control of the surgical environment by those physicians, the clinical trial’s treatment parameters and the clinical trial’s patient inclusion and exclusion criteria. Although many clinical trial patients after the CustomVue procedure saw 20/20 or better and/or had or reported having better vision during the day and at night compared to their vision with glasses or contact lenses before the procedure, your results may vary. Only an eye care professional trained in laser vision correction can determine whether you are a suitable candidate for the CustomVue procedure. As with any surgical procedure, there are risks associated with CustomVue treatment. Before deciding whether to have the CustomVue procedure, you should ask your doctor for and carefully review the written materials provided to you. It is important to discuss the risks associated with the procedure and any questions you may have about the procedure with your doctor.